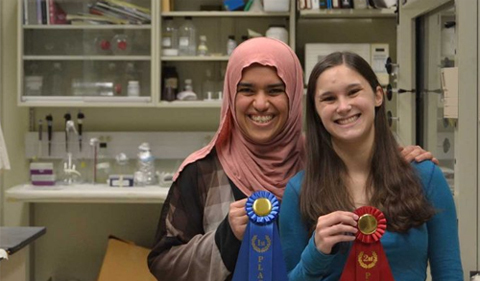 From left, Sazan Ismael and Marissa Smarelli display prizes for their research at Neuroscience Research Day. When facing complex problems, it’s often best to consider simplified perspectives. In the labs of Biological Sciences professors Dr. Daewoo Lee and Dr. Robert Colvin, student researchers are studying the pathology of Alzheimer’s disease using a comparatively simple animal model: the fruit fly. Sazan Ismael, a doctoral biology student in the Molecular and Cellular Biology program and Marissa Smarelli, an undergraduate HTC Neuroscience student, are both using fruit flies as a model to study the role of tau protein in the progression of Alzheimer’s disease. Ismael and Smarelli won first and second prize, respectively, in the graduate and undergraduate student competitions for Neuroscience Research Day. Ismael and Smarelli both work with transgenic flies that have been modified to express variants of human tau, a protein that is known to aggregate in the brains of Alzheimer’s patients. The role of tau in Alzheimer’s disease is not yet fully understood. Ismael, who works in Lee’s lab, is studying the release of tau protein in Alzheimer’s disease. This work is being performed in collaboration with Colvin’s group. She works with transgenic flies that express the human form of tau. Using both chemical and light stimulants to induce depolarization in neurons, Ismael found that cell depolarization leads to the release of tau from neurons. Because neurons in certain regions of the brain are known to be hyperactive in early stages of Alzheimer’s disease it is likely, Ismael said, that tau is being released during depolarization and is subsequently taken up by other neurons, where it may aggregate. Although these tau aggregates are a well-known characteristic of Alzheimer’s patients, the functional significance of tau is not yet fully understood. Smarelli, who is co-advised by Lee and Colvin, is performing experiments to determine how tau affects neuronal function in a fly model. To determine whether tau is toxic to cells, Smarelli is also working with flies that express human tau. Using green fluorescent protein (GFP) as a marker, she is measuring the number of tau-positive cells over a time period. Additionally, she is using an anti-human tau antibody to track the number of tau positive cells over time. A decrease in the number of tau positive signals may be indicative of tau toxicity, Smarelli said. In addition, Smarelli is determining whether tau affects fly behavior. Smarelli is tracking the movements of larvae that express human tau in motor neurons. If their movement is impaired, this may indicate that tau impacts the function of neurons involved in locomotion. Although Ismael and Smarelli are both still working to understand this complex system, Ismael said Neuroscience Research Day marked an important moment in her graduate career.